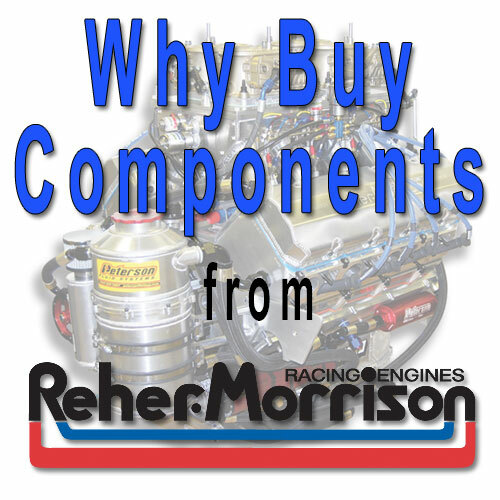 Categories: Parts, Why Buy Components from Reher-Morrison. Quality – Reher-Morrison works with our suppliers to select the highest quality performance parts possible. Reher-Morrison also customizes many components we sell. We put the same effort into ensuring the quality of our components and engines. We focus on properly matching and checking components. Much of the work on components is done on our CNC machines. The CNC work is precise and consistent, which further ensures the components’ high quality. Performance – Reher-Morrison uses our track experience at the track and building engines to select the highest performing components possible. New innovative components that improve performance of our Super Series engines are also made available for purchase. We work with you to choose the components that will give you the best performance. No component (or horsepower claim) is one size fits all. You need the components that will give you the highest reliability and performance on your engine. Service – Our knowledgeable staff of racers works with every customer to find the component that they need. With this service, you don’t have to be frustrated with wasting money on parts that don’t end up fitting, fail to produce promised horsepower gains, or aren’t even what you expected to receive. Sometimes, you need to talk to a knowledgeable person who can give you more information than a description on a website. We focus on your performance needs and what will work best for your racing application. We also provide support once you have bought components. If you have any questions, we are more than happy to answer them.